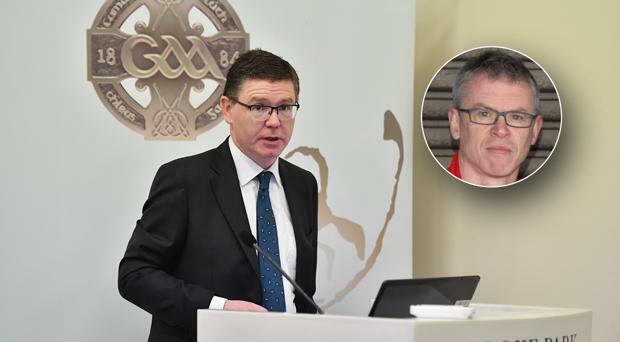 Joe Brolly has reacted with disappointment to the news that Tom Ryan has been appointed the new Director General of the GAA. The Carlow native succeeds Paraic Duffy in the role having held the position of the GAA's finance director for the past 11 years. Brolly has been calling for radical change in how the GAA works to combat what he sees as the commercialisation of our national games. The 1993 All-Ireland winner described Ryan as an 'insider' and claimed the change needed would not arrive under the 48-year-old's stewardship. "As expected, (it's) an insider, a financial man, a numbers man. Not someone who's known to GAA folk," he told Saturday Sport on RTE Radio One. "In essence, he's Peter McKenna, the commercial manager's deputy, his right hand man. Unfortunately, it's symptomatic of the malaise we have in the GAA. "It was obvious that if this was any other corporation - given the problems that we've had with structure, leadership and strategy that we've had over the past 15 years - they would have been going for an outside candidate, someone with vision, with strategy. "What is there about Tom Ryan that suggests that he can lead in such difficult times where we need to protect ourselves against the modern world, the commercial world? "What Tom Ryan will do is just 'more of the same'. I heard him saying months ago that if it's (the GAA) not broke, don't fix it. "Unfortunately, there was some optimism at one stage that there might be a move towards tackling the real problems that we have, but this will just be more of the same now. "And I think it's a pretty bleak day for the association, I must say."